We’ve reached a milestone moment in space history. For the first time ever, a black hole has been captured on camera. The scientists behind the achievement, who number over 200 in total, reported their findings a couple of days ago in a set of six papers in a special issue of The Astrophysical Journal Letters. However, of the 200 scientists, 29-year-old Katie Bouman was the first to take a look at the freshly rendered image of the black hole. The picture of her reaction to it, where she is seen looking towards the camera positively thrilled, is currently going viral on the internet. Bouman, who was a PhD student in computer science and artificial intelligence at the Massachusetts Institute of Technology, joined the team of researchers some six years ago and has since been responsible for the image creation algorithm. She is, according to numerous reports, instrumental in the creation of the image. 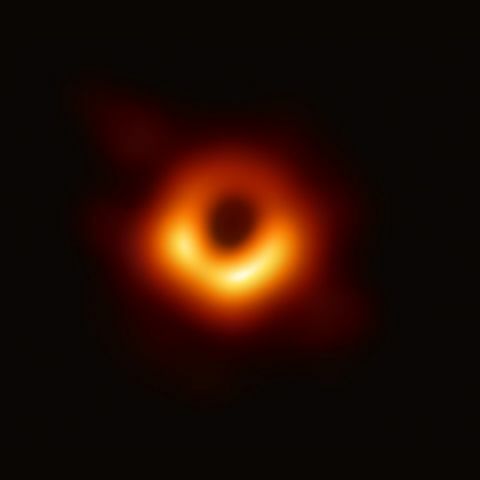 The black hole in question is 55 million light-years (500 million trillion kilometres) away from us and was photographed using the Event Horizon Telescope (EHT), the result of synchronising numerous telescopes across the globe. The image captured shows a black hole at the centre of Messier 87, an enormous galaxy in the nearby galaxy cluster of Virgo. According to a news release from the Event Horizon Telescope website, the black hole measures nearly 40 billion kilometres across and has a mass 6.5 billion times that of the Sun. The EHT essentially links numerous telescopes from around our planet to form one big planet-sized virtual telescope with extremely high sensitivity and resolution. “No one algorithm or person made this image, it required the amazing talent of a team of scientists from around the globe and years of hard work to develop the instrument, data processing, imaging methods, and analysis techniques that were necessary to pull off this seemingly impossible feat,” Bouman wrote on her Facebook post, with an image of her team. A black hole is a region in space with extremely strong gravitational pull. The pull is so strong that nothing can escape from it, including particles, electromagnetic radiation, and light. The boundary around a black hole is called the event horizon and it’s often termed “the point of no return”. In the image captured, a halo of bright gas can be observed around the black hole. Light emitted from within the event horizon can never reach the observer outside, and the observer, in turn, will never be able to see beyond the event horizon.